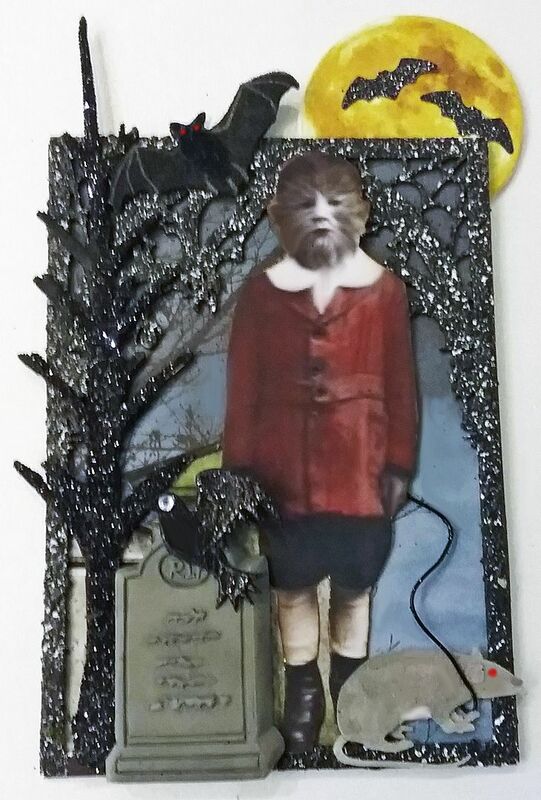 When thinking about projects for this Halloween season, I realized that in the hundreds of Halloween pieces I’ve made, none of them are Ghost themed so I’ve rectified that with 2 ghost-themed projects and new ghostly image sets. 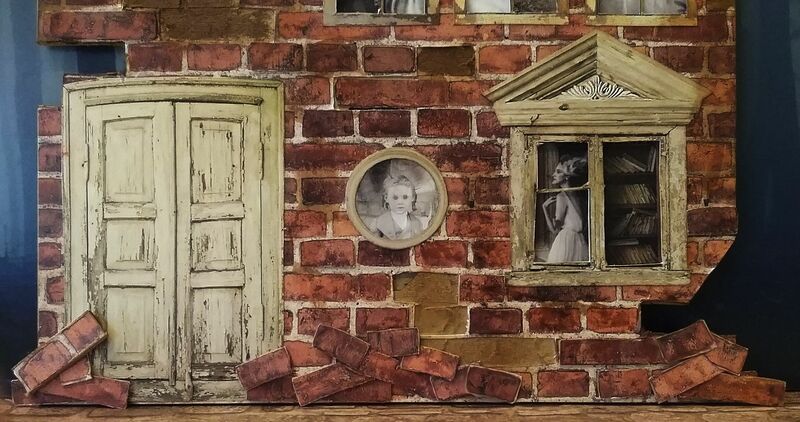 On the edge of Grimsley Village is a crumbling brick house. 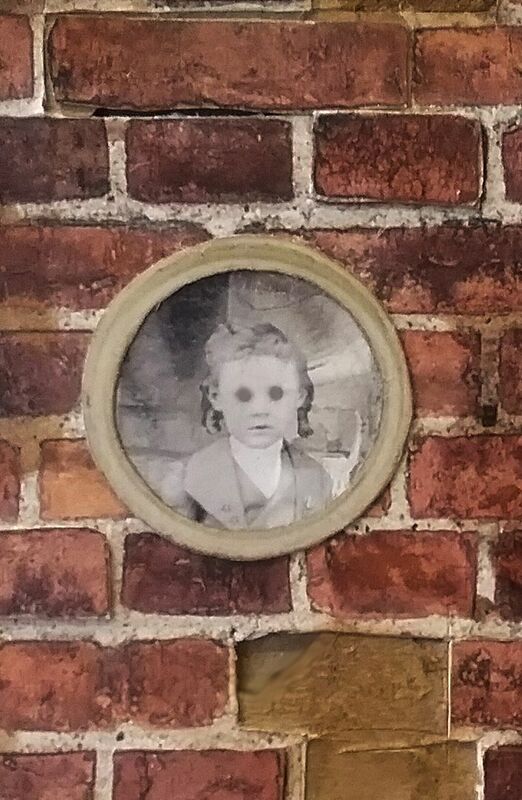 It’s had many residents during its life; some of which have died and now haunt the house. The house is crumbling with piles of bricks blocking the door and holes in the roof. 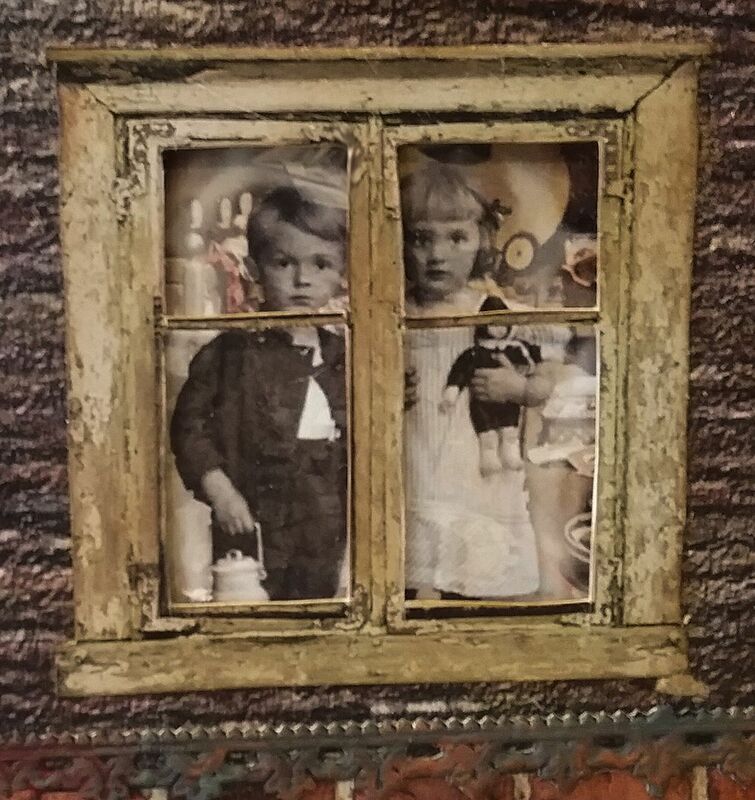 Two of the most famous ghosts are Sarah and James who were seemingly lovely polite children. Their parents employed a governess as they were frequently away. Each time they returned from a trip they would find the governess unwilling to continue. The parents assumed the problem was the isolation of the house and the lack of adult conversation. Upon returning from an unusually long absence, the parents discovered that the latest governess had fled, abandoning the children. Oddly enough she left all of her things behind some of which looked like they were stained with blood. Next, there is Abigail who had all but given up on finding her true love. Then one day unexpectedly she met Thomas; tall, handsome and witty, it was love at first sight. On their wedding day, Abigail discovered that Thomas had fled with her maid of honor Sarah. In a fit of deep despair, she jumped from the roof of the House of Ghosts. Thomas and his new bride Sarah moved into the house but they weren’t alone as Abigail was waiting. Thomas and Sarah were never seen again. Georgie Porgie scared them away. 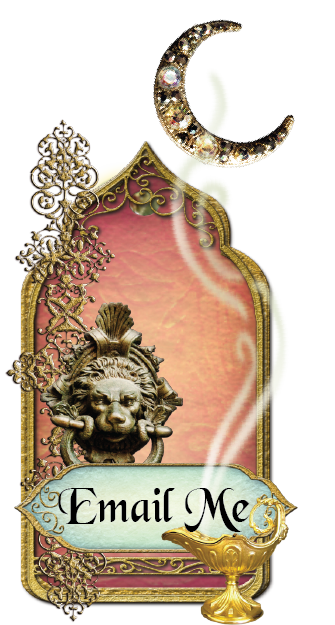 You’ve been forewarned, enter the House of Ghosts and you might be next. The house is constructed using the Large Haunted House Frame Set. 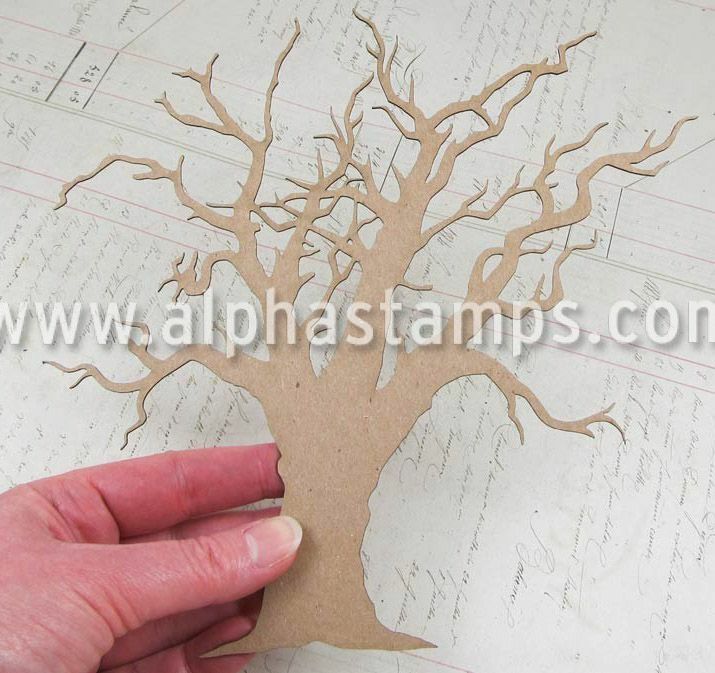 For paper, I used Red Brick Wall Scrapbook Paper. I cut some of the brick away and added bricks backed by chipboard to the base. 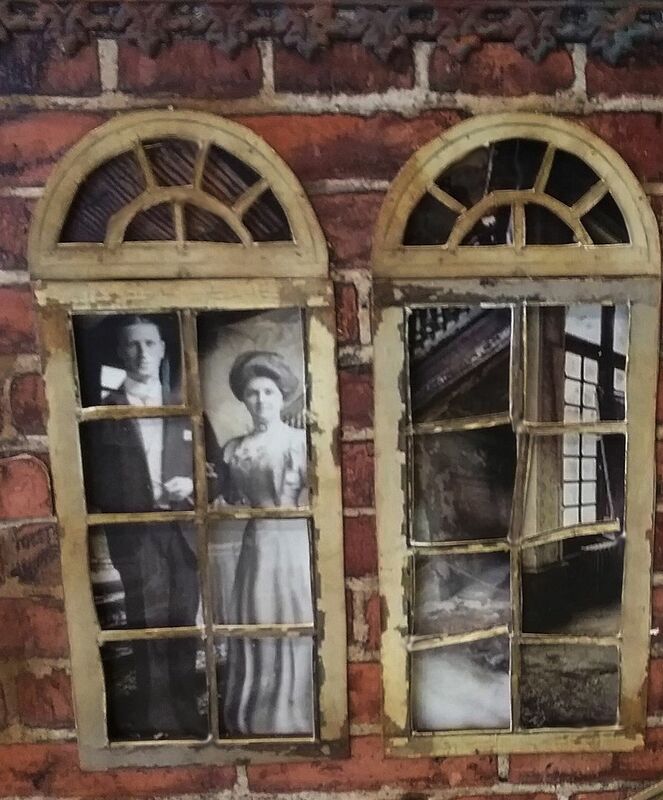 After gluing the paper to the house I peeled away some of the bricks (cutting out the shape first with an X-Acto knife) to expose the chipboard beneath. 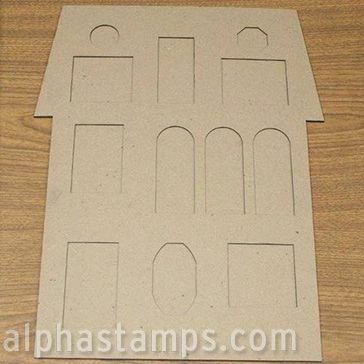 I used Hampton Brick scrapbook paper for the roof. I then cut away sections and in one of the cutaway areas, I added wooden skewers to simulate the roof framing. 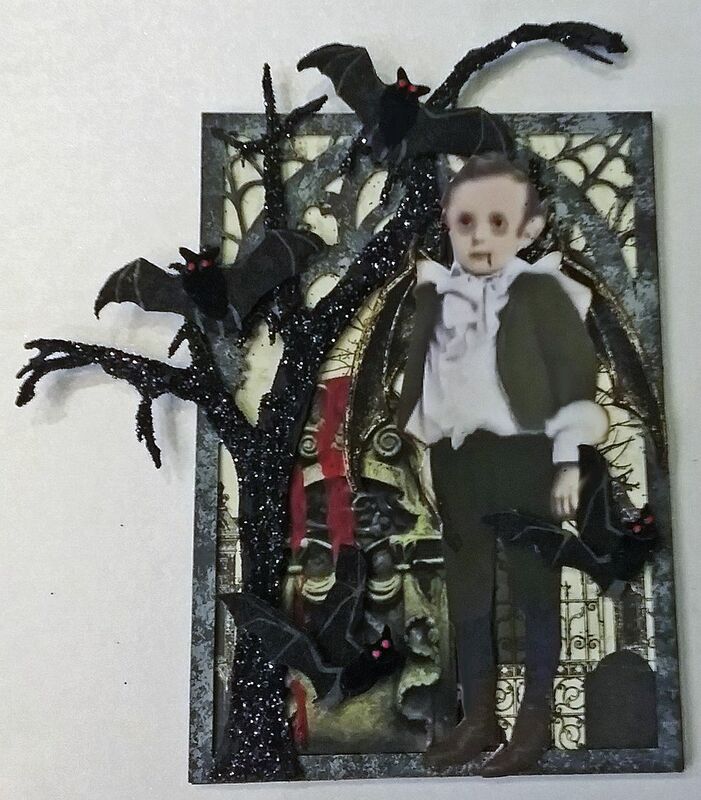 At the top of the roof is a chipboard Bat Border which I painted with a combination of grey, red, and orange acrylic paint. 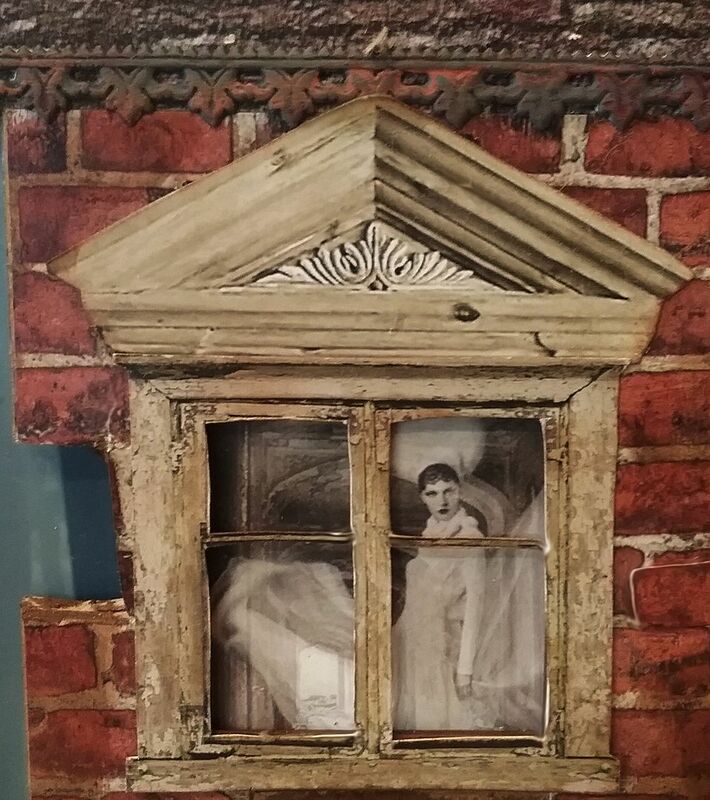 The ghosts are from my new Ghosts in Abandoned Rooms collage sheet and the picture frames are from my Shabby Architecture collage sheet. 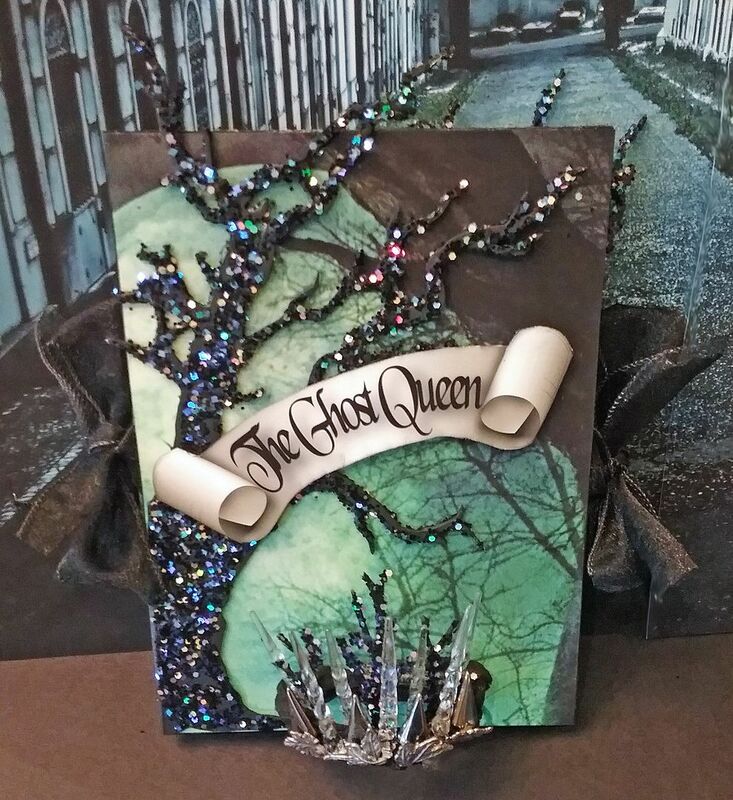 This project was inspired by a poem I wrote and the Dark Hollow 12 x 12 Collection Kit. 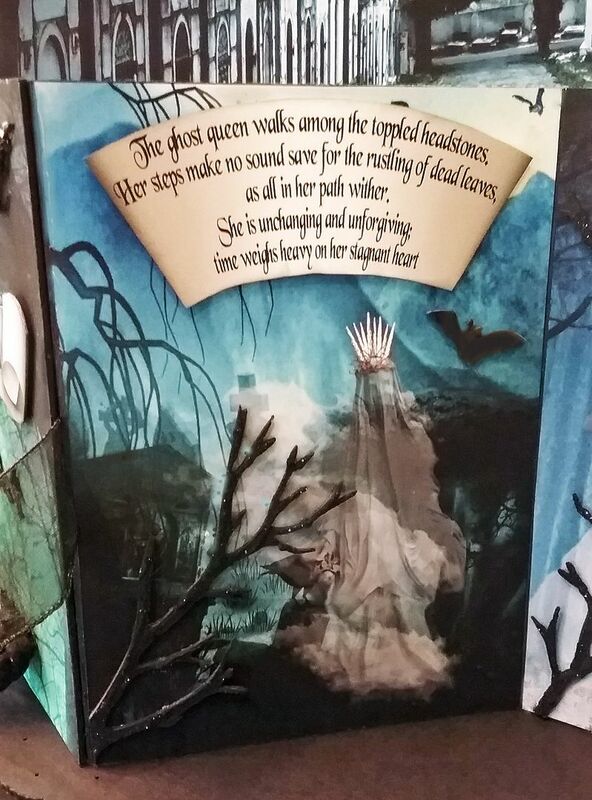 The ghost queen walks amongst the toppled headstones. Her steps make no sound save for the rustling of dead leaves, as all in her path wither. She is unchanging and unforgiving; time weighs heavy on her stagnant heart. A cold wind brings shape to the mist revealing the others. Bound to the earth by bonds of their own making, floating on a sea of endless sorrow, the silent procession reaches the hollow. She watches as the barrier dissolves; a barrier no thicker than the silk from a spider’s web, a moment when life and death merge into one. She reaches out to touch the past. Too quickly a bright moon rises, melting the mist and lifting the darkness. She fades away with a sigh and a whisper as one cycle ends and another begins. 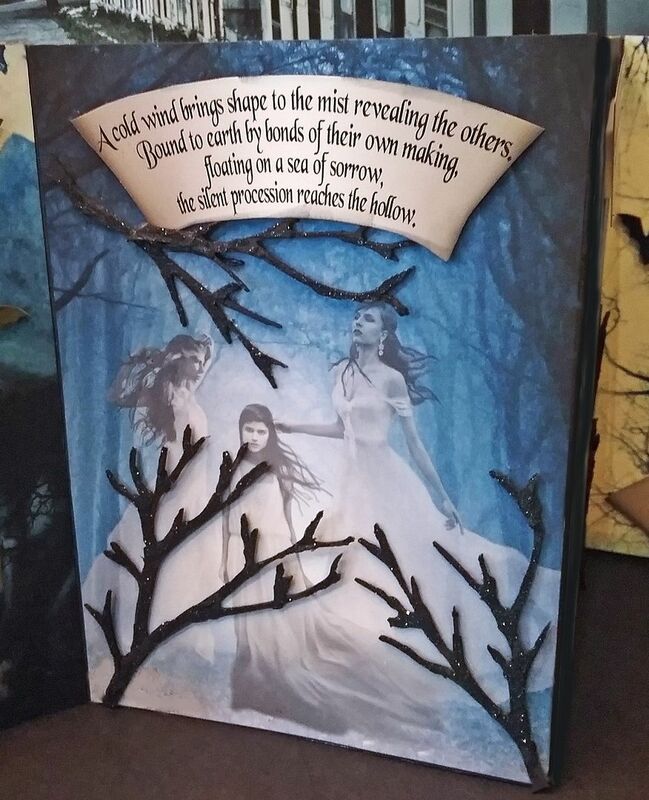 I decided to illustrate the poem using a simple accordion fold book. 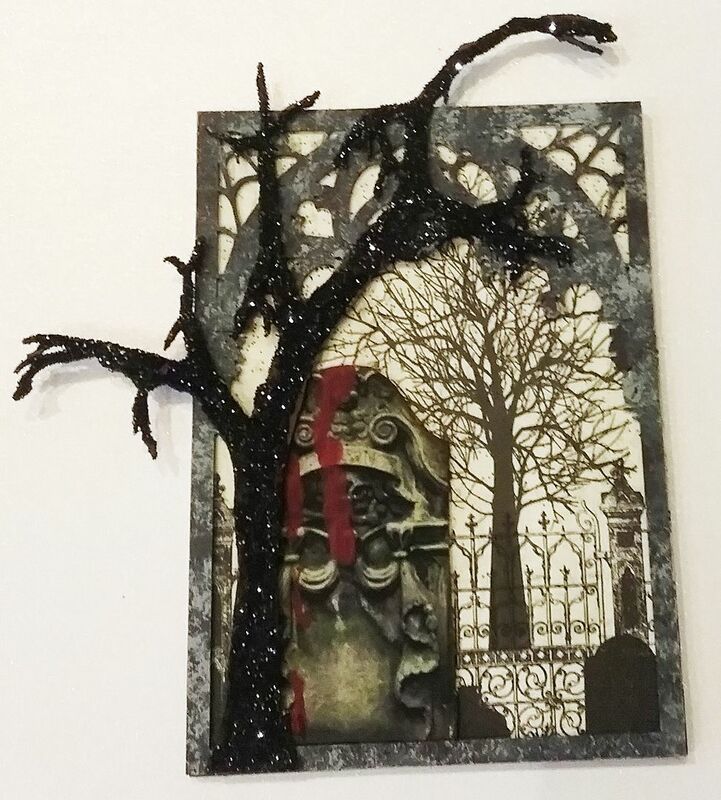 To decorate the cover I used an 8” creepy tree cut in half (I used the other half later in the book) covered with Raven Iridescent Glitter. 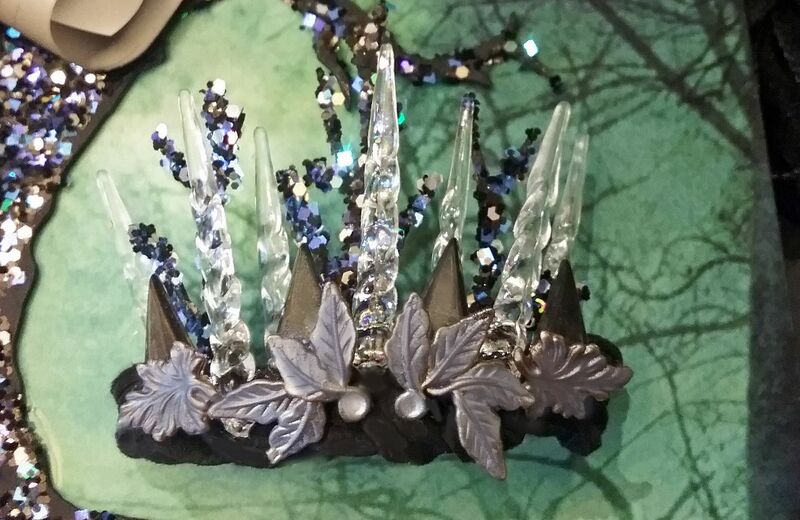 To make the crown, I first braided some leather cording to serve as the base. 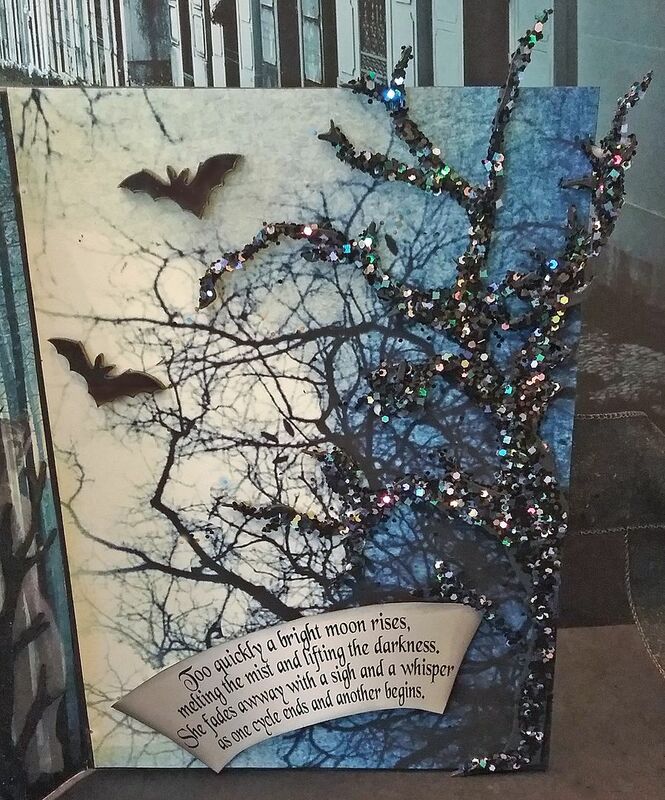 Next, I attached Clear Mini Icicle Ornaments, Twisted Leaf Charms, and branches from a 6” chipboard tree (I used other pieces of the tree to decorate other pages) covered with more of the raven glitter. I also use the silver metal triangular charms from my stash. 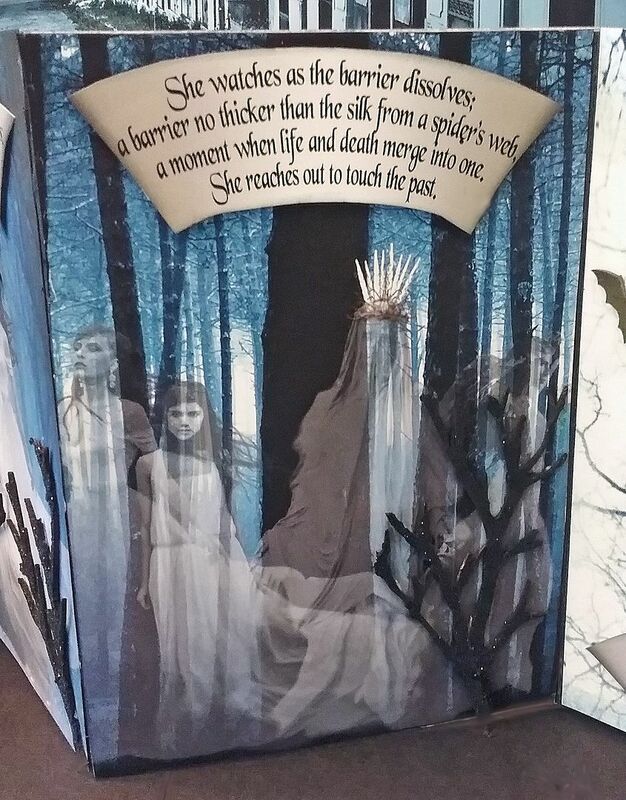 Inside the book are four pages that illustrate each section of the poem. The ghosts are from my Ghosts digital image set. 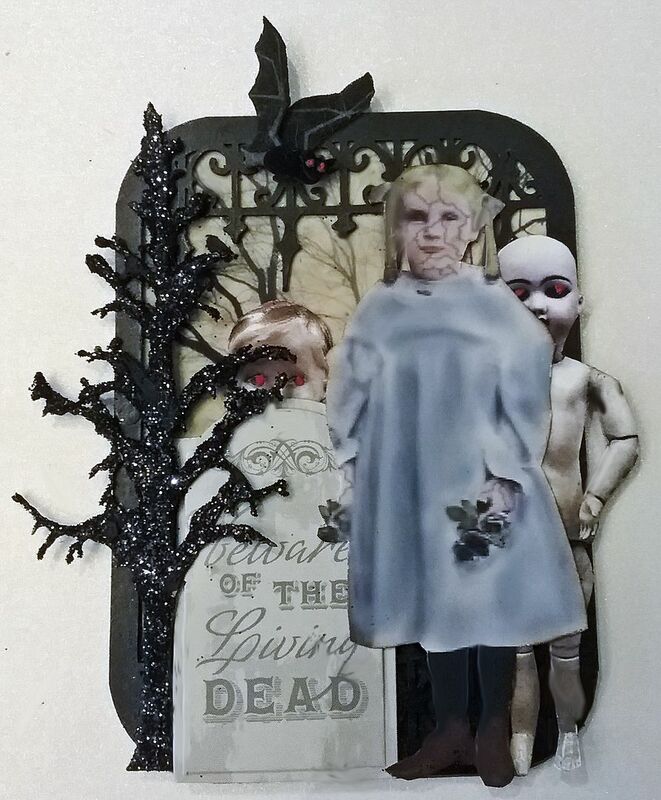 There are several isolated semitransparent ghosts in the image set which I printed on the Dark Hollow papers. 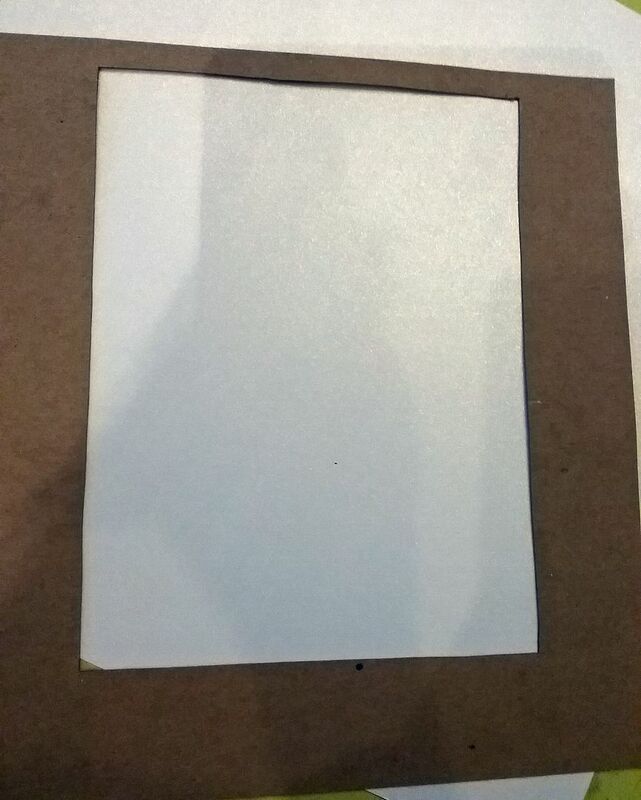 I decided to make a chipboard template the size of the pages (5" x 7") to use in selecting which part of the 12" x 12" paper I wanted to use. 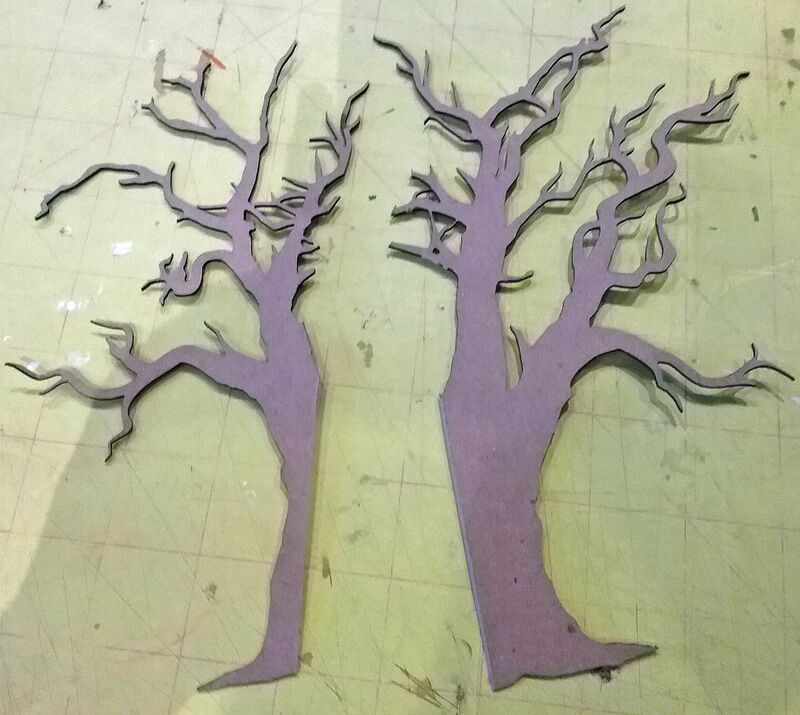 I marked and cut out the section and then ran the paper through my printer and printed the ghosts onto the paper. 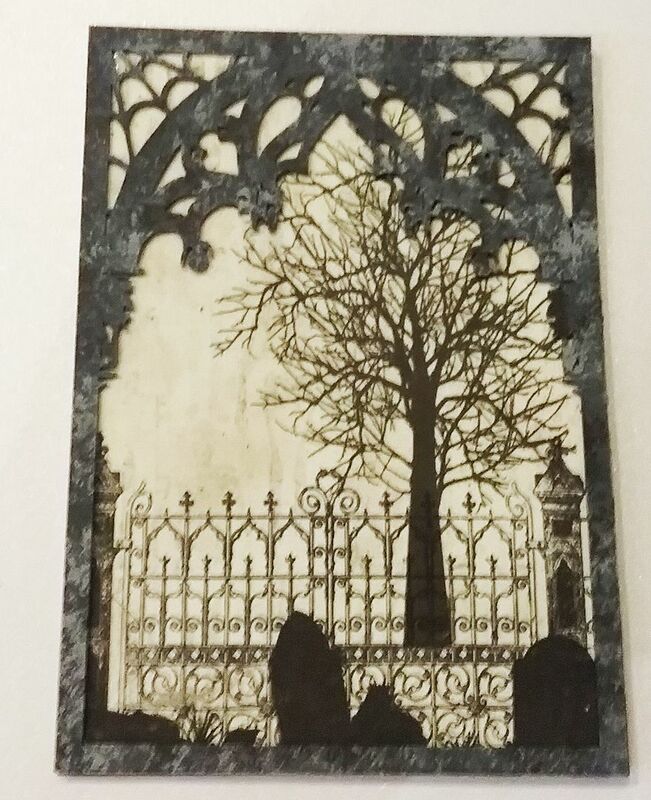 Another way to use the ghosts is to print them on vellum or transparency film. 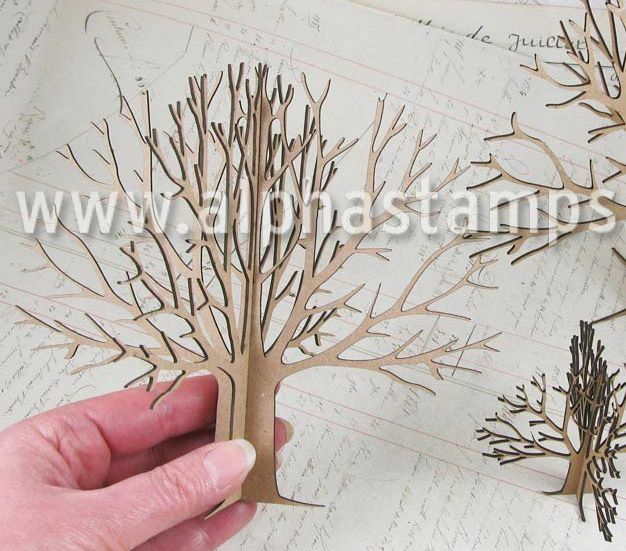 Click here for a detailed tutorial on how to make and assemble an accordion folded book. To complement these projects I’ve created 5 new collage sheets and 2 digital image sets. 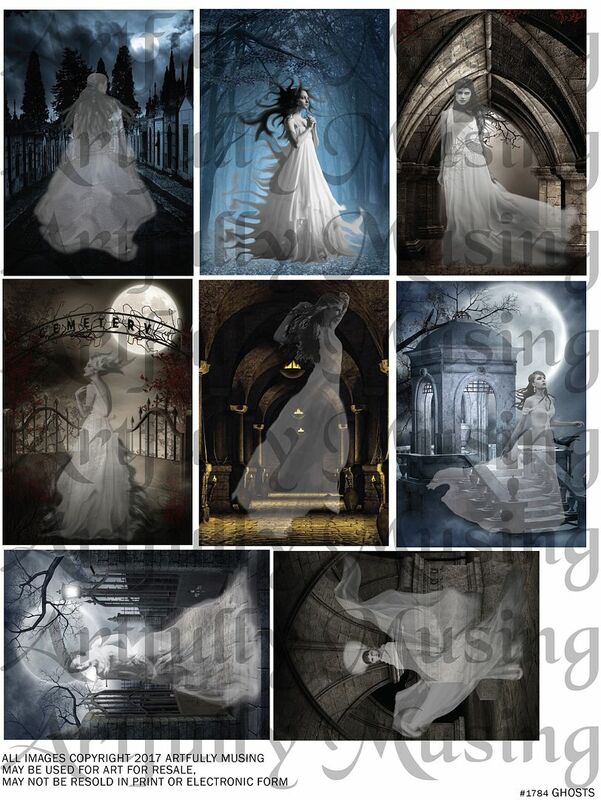 This sheet contains 8 ATC sized interior backgrounds haunted by ghosts. 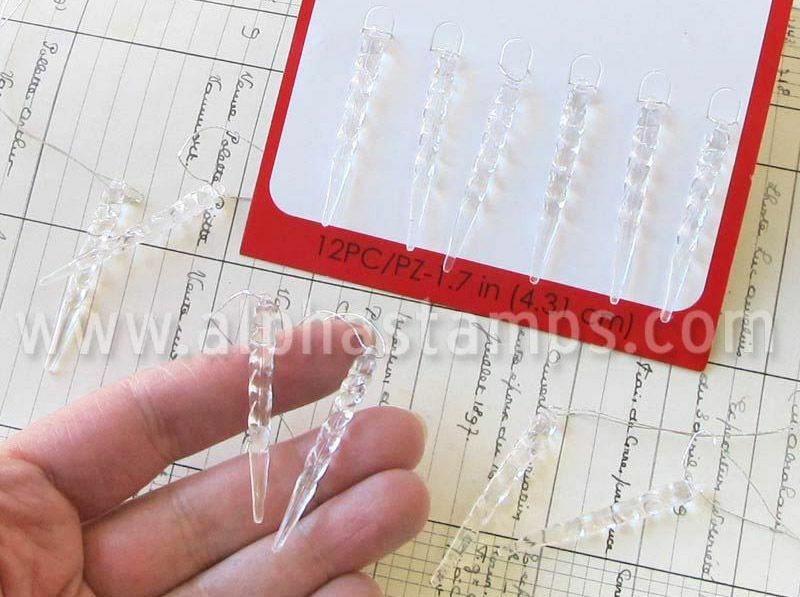 In addition to using them as an ATC, they could also be used behind a window. 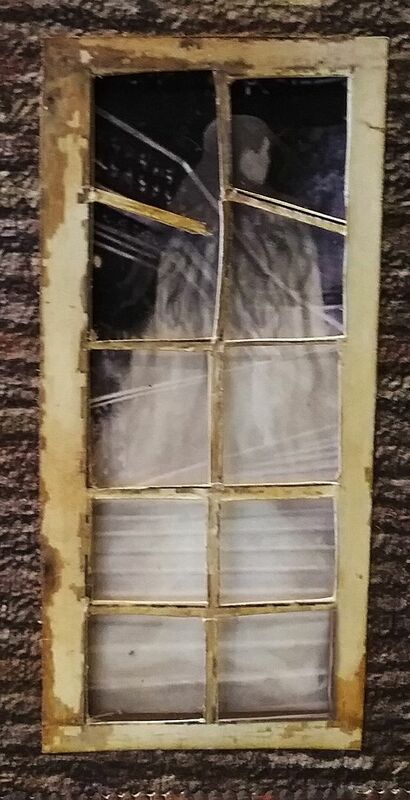 This sheet contains 8 ATC sized backgrounds haunted by ghosts. In addition to using them as an ATC, they could also be used behind a window. 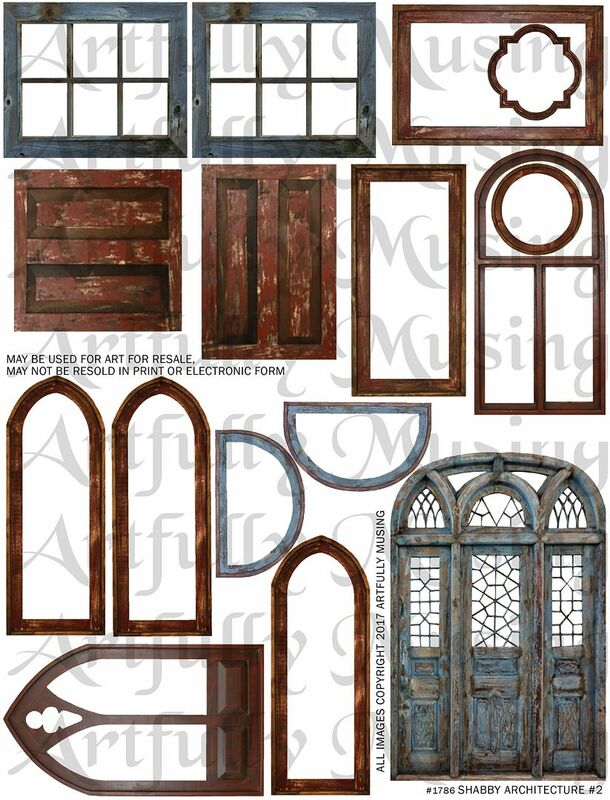 On this sheet, you’ll find all kinds of shabby windows with interior ghost screens. 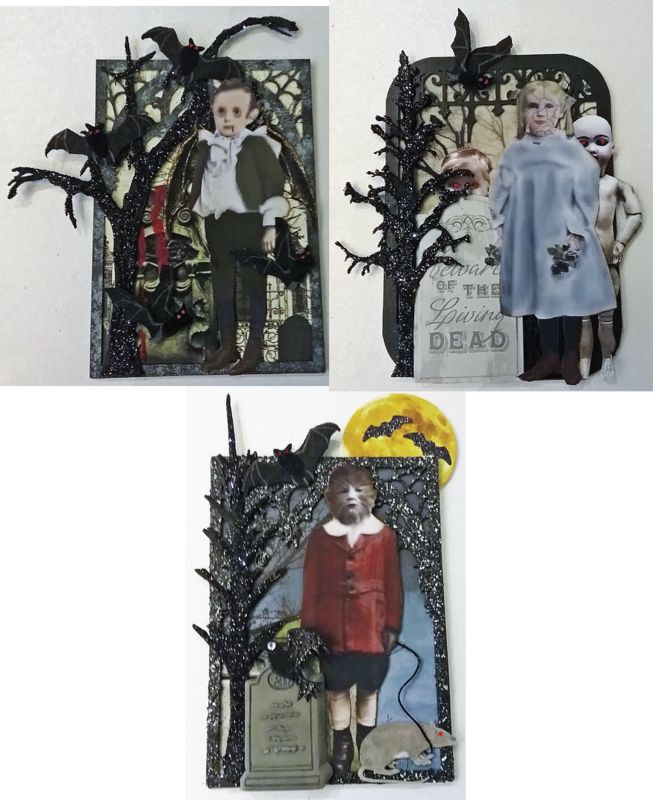 They would work well for either the Large Haunted House Frame Set or Large Haunted House Shadowbox Set. 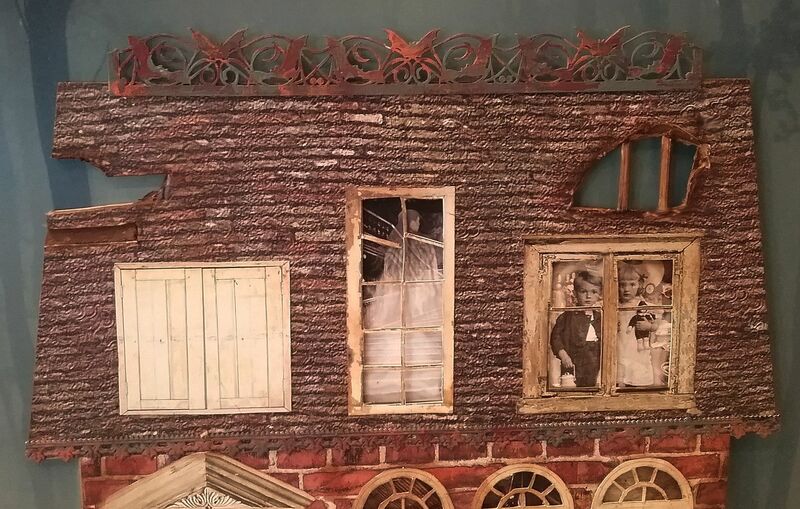 Both the background images and the ghost in the windows images would work well for any of the Grimsley Village haunted houses. 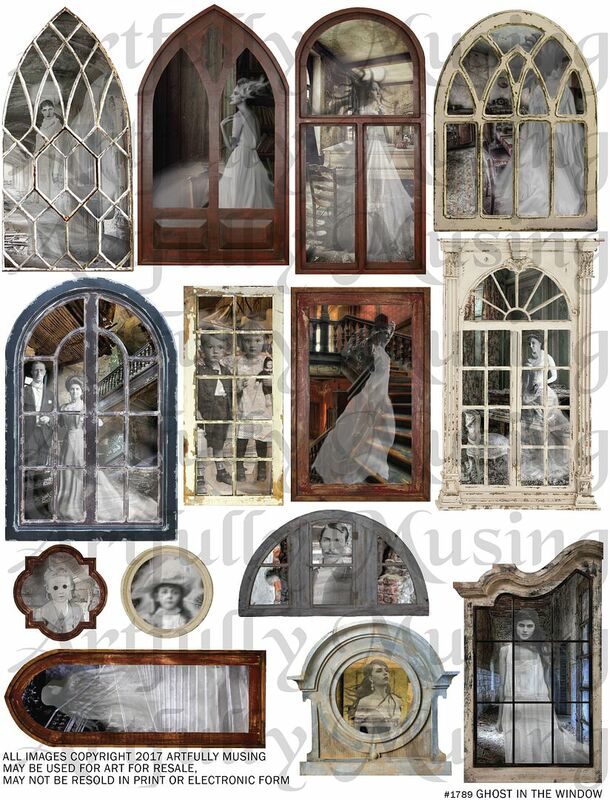 These are sized for the Large Haunted House Shadowbox Frame Set or the Large Haunted House Frame Set but would also work well for any of the Grimsley Village houses. Some of the windows are duplicated so that you can make the windows on the haunted house symmetrical. 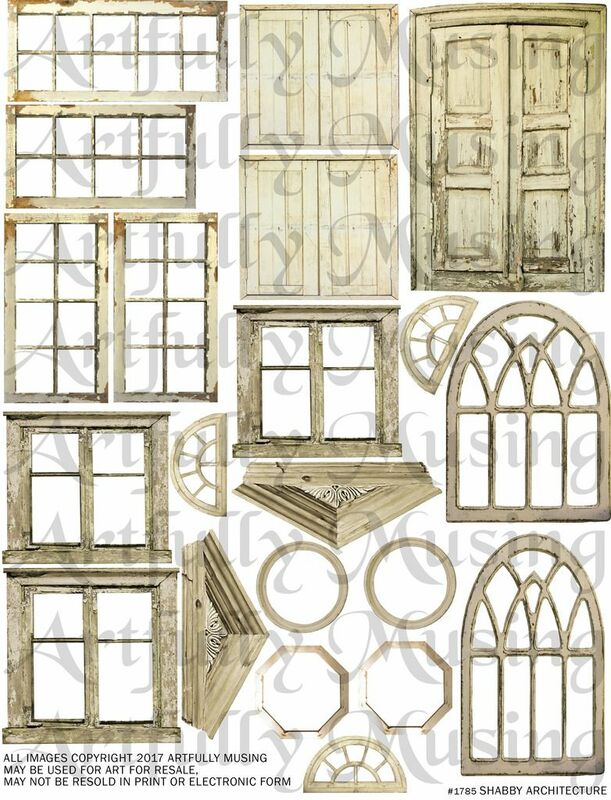 This set contains all of the images from the Shabby Architecture #1 & #2 collage sheets plus 6 more images for a total of 27 images. 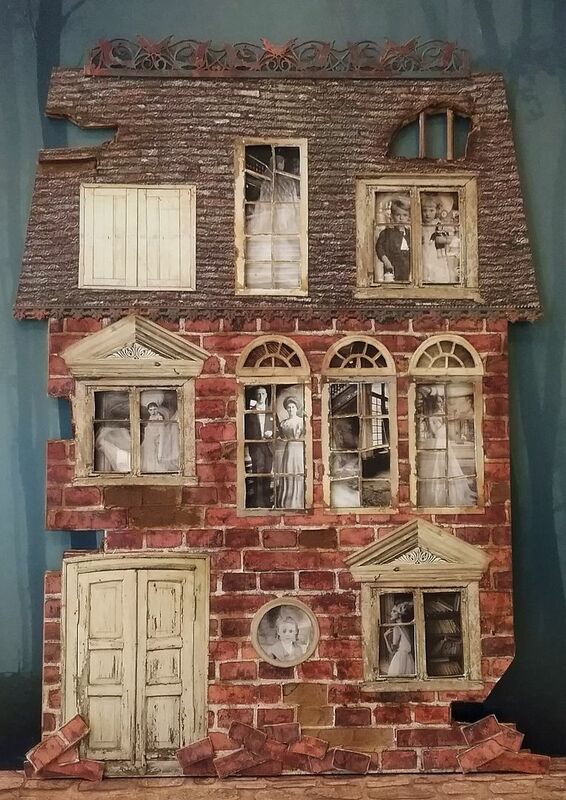 These are sized for the Large Haunted House Shadowbox Frame Set or the Large Haunted House Frame Set but would also work well for any of the Grimsley Village houses. 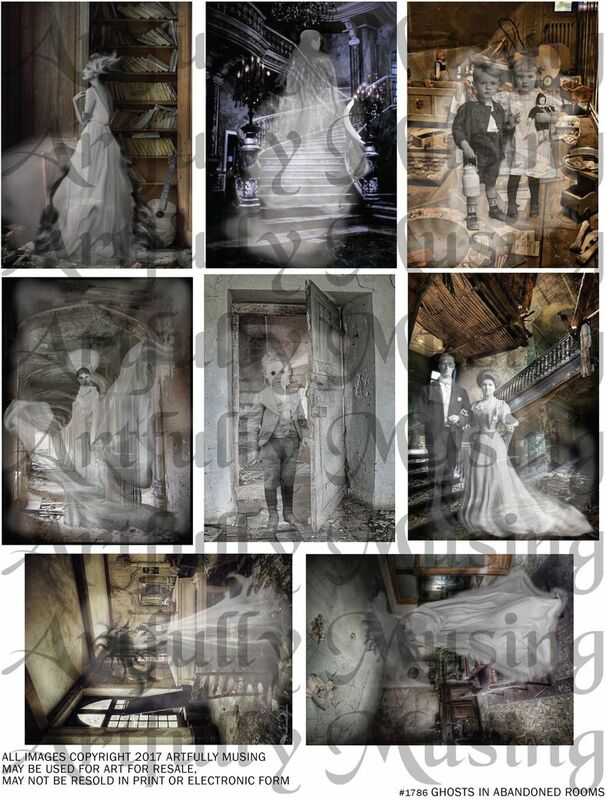 This set contains all of the images from the Ghosts, Ghosts in Abandoned Rooms & Ghost in the Windows collage sheets. 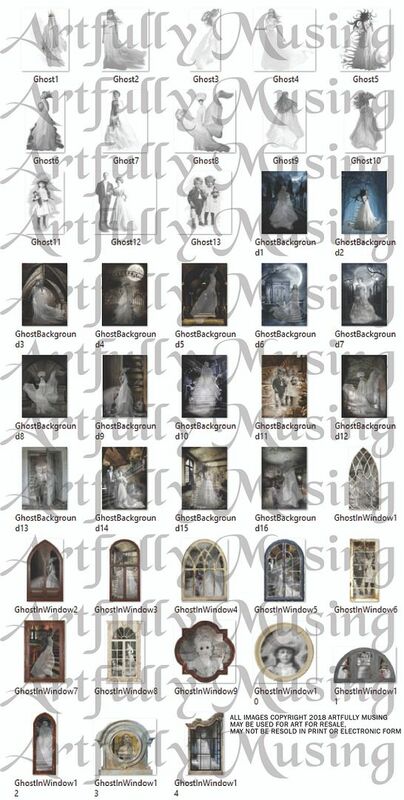 In addition, there are 13 additional isolated ghosts, for a total of 43 images. The isolated ghosts can be printed on patterned background paper (as I did for this project), transparency film or vellum. 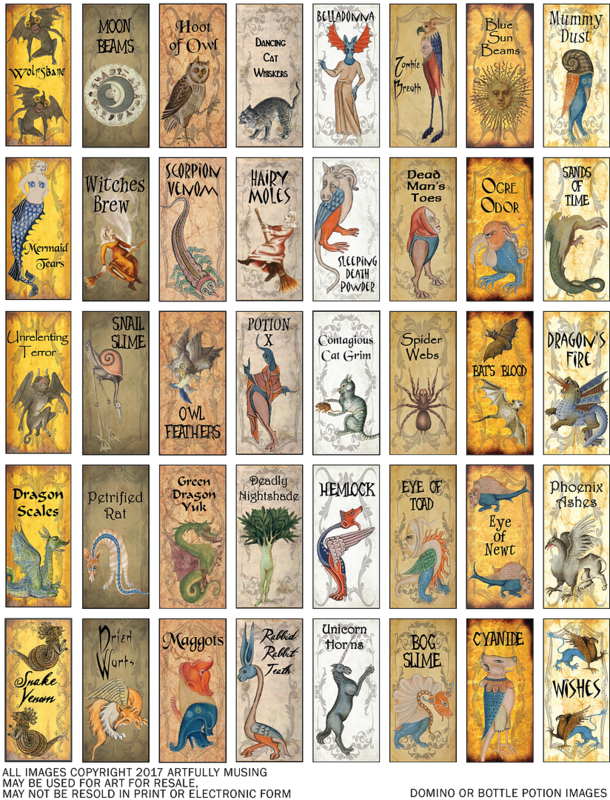 The 16 background images are ATC sized and work well behind windows. 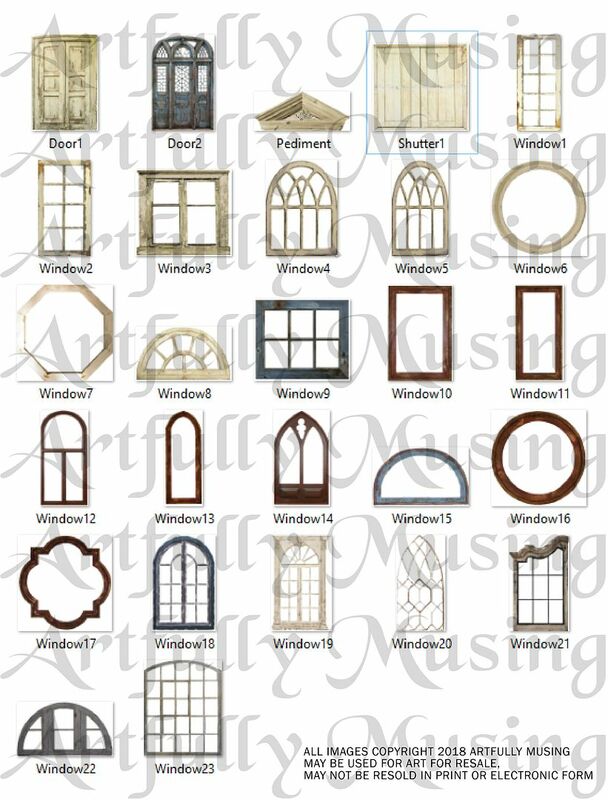 The 14 Ghost in the Windows sheet would work well for either the Large Haunted House Frame Set or Large Haunted House Shadowbox Set. 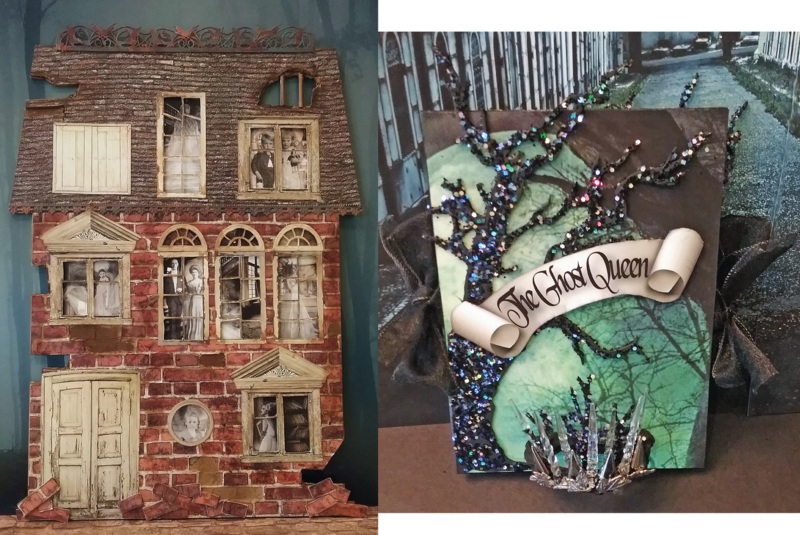 Both the background images and the ghost in the windows images would work well for any of the Grimsley Village haunted houses.